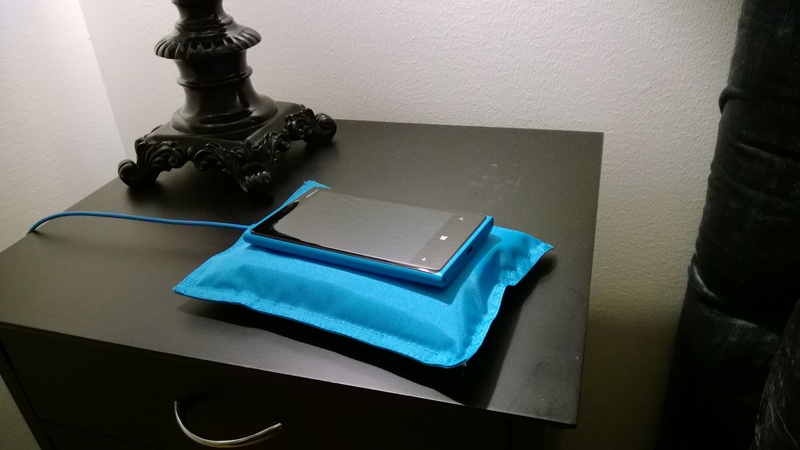 The Nokia DT-901 Qi Wireless Charging Pillow by Fatboy is like a dream (pun intended) come true for all of those who don’t like to fiddle with chargers and cables. It charges using inductive charging. The product page at Nokia says “Relax and recharge”. 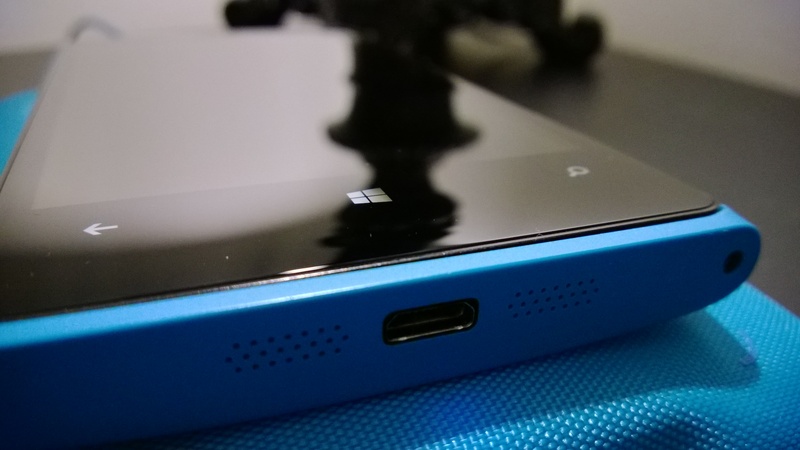 I tried it in cyan for my ex-fiancées cyan Nokia Lumia 920 which has support for this built-in. The Qi Wireless charging standard sprinkling magical electricity onto the batteries of smart phones. A slight moment after placing the smart phone on the pillow, it charges. That’s what it does. It’s simple. And it does it well. It took about 2 hours and 50 minutes to fully charge from being completely depleted. A minor annoyance is that if you place the phone incorrectly, on occasion, it’ll start and stop charging randomly or not charge at all. That’s a minor issue but one that should be useful to know about (RTFM?). You just really wanted to know about the candles, the lamp, the bedside table and the headboard? They’re no IKEA. My ex-fiancée had an aptitude for that0. 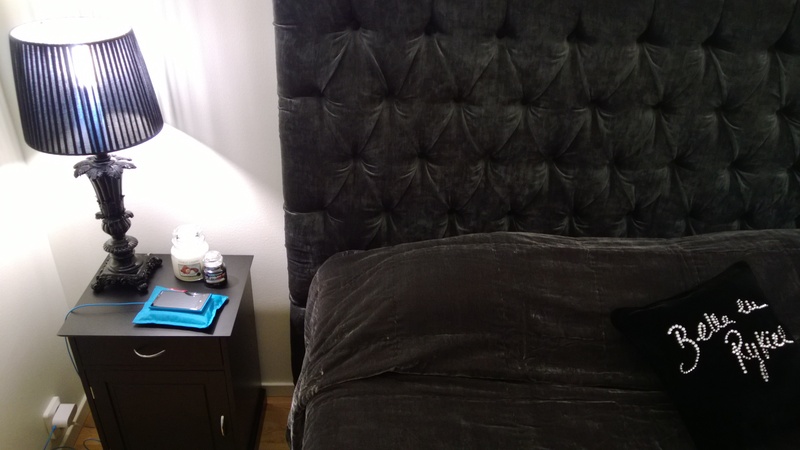 The headboard and bedside table are from Trendrum AB in Sweden. The lamp is from Ellos AB in Sweden. Then, Yankee Candle of course. They have a fundraising program, they do charitable giving and have a sustainability commitment. Made with natural fragrance extracts, real essential oils and natural fiber wicks, the lovely fragrance is an added benefit. And their Car Jar is fantastic. Their wax is Paraffin, so at least its vegan friendly, and made in South Deerfield, Massachusetts. It will only emit carbon dioxide and water vapor. (Yankee Candle should sponsor this blog post.) There are also the WoodWick Candles with their soy wax and wick made of wood. Although, at first, Virginia Gift Brands didn’t want to disclose what their wax blend consisted of, but eventually a customer service representative wrote that their wax is a soy based paraffin wax, I don’t know… They manufacture in Virginia. This entry was posted in Reviews and tagged 920, Charge, Charging, Decor, Decoration, DT-901, Electromagnetic induction, Fatboy, Inductive, Interior design, Lumia, Nokia, Pillow, Qi, Recharge, RTFM, Smart Phone, Sonia Rykiel, Virginia Gift Brands, Wireless, WoodWick, Yankee Candle on 7 January, 2014 by Spiritus et Technologiae.